Marie Taylor has skied the finest resorts in Canada, but never the Alps. In a series of special reports for PlanetSKI she compares the two. As a first time skier in Europe where is the best place to go? Step forward Les3Vallees in France. 600kms of piste served by 180 lifts. The skiing starts at 1,260m and goes up to 3,230m - 1,970 of vertical. Even the largest ski area in North America, Whistler in Canada, would fit into a corner of it. And in comparison my favourite resort in Canada is Lake Louise: 10 lifts and 4,200 acres of terrain. Skiing starts at 1,645m and goes up to 2,635m - 990m of vertical. And where better to stay than Les Menuires in accomodation provided by the UK chalet company, Powder N Shine? It could hardly be more different than the Canadian ski experience. Canada v France - who's going to win? I'll be looking at the ski area, the snow, the accommodation, the mountain restaurants, the atmosphere, the après and the overall experience. So, which will come out on top? For those of you unfamiliar with skiing in Canada I'm going to let you know about the accomodation options. And then compare to the rather odd (very odd to me) concept of the ski chalet where you seem to go on holiday with a bunch of complete strangers. To put it mildly this is an alien concept to me. What happens if you don't get on? When off to the slopes in the Canadian Rockies, usually the best thing to do for accommodation is to book a hotel. And the closer to the centre of town, with its restaurants and shops, the better. You'll need to plan where you want to go out for your meals at peak season and reserve a table the day before. Otherwise you might be waiting for over an hour to be seated after a long day of skiing. Or, sometimes it's easier to book a hotel room with a kitchenette so you can bring along meals to cook and enjoy in your room. This is something I would do quite often, you can never go too far wrong when all you have to do is put a lasagne in the oven that you prepped at home beforehand. Now I should explain that I have been skiing in Canada rather a lot - with friends and family. I started as a 3-year old and have loved it with all my heart ever since. Skiing and the Canadian Rockies runs through my veins. Here I am with my sister, Alison....that's me on the right on my first ever ski. Skiing kinda does that to people. Oh heck, meet the whole family ....here's Dad and Mom too. 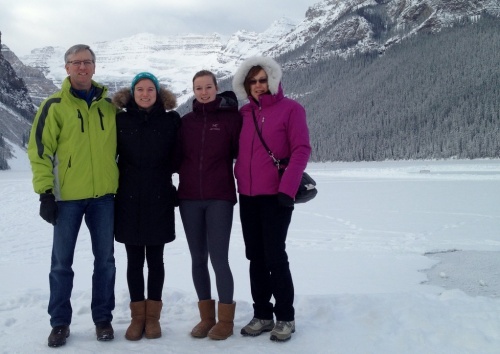 We're standing on the frozen lake at Lake Louise - as I said, my favourite resort. I don't know what they will make of me sitting down to dinner with a bunch of total strangers in the Alps. And I thought the British were supposed to be reserved and shy. Back home, the main ski town is usually about a 20-minute drive away from the resort. This is mainly because the Canadian resorts are not built around a town, or in the case of Les 3 Vallees, built around multiple towns. In Canada you usualy either drive or catch a public bus to get to the ski hill. My local hill of Sunshine Village is an exception as it has ski-in, ski-out accommodation but this is rare in the Canadian Rockies. There are some, but not many. And if you do want to stay on hill, usually you're only option is to stay at the one hotel that is owned by the ski resort. So, you have to make the decision on whether you'd like to be in the centre of town where everything is happening with events, plenty of restaurant options, and activities to do. Or whether in the morning you'd like to be able to step right onto the slopes without needing to get in the car. This is where spending the weekend at PowderNShine's Chalet Neve in Les Menuires in Les3Vallees was amazing. The other accomodation options in Les Menuires are also on the slopes. But I was in the UK style chalet option. We were in the middle of Reberty, yet just had to walk out the back door and the slopes were right there. No need to get in a cold car and drive up any icy roads. And being able to ski right to where you're staying at the end of the day is just as great. No need to worry about how many beers you can have at après since you don't have to drive. The chalet itself is wonderful, so cosy and you feel right at home. Big comfy bed, a nice open living room with a fire and of course a hot tub for sore muscles after a long day of skiing. Our chalet hosts Emily & Tom were great, always kept us on schedule and made sure we had everything we needed. They were always happy to give advice on where to go skiing and how exactly to get to certain areas of Les 3 Vallees. Useful advice as the ski area is massive and not quite so easy get to know as a Canadian one. As I said there are 600kms of piste served by 180 lifts here in Les3Vallees. Of course the staff at the Canadian hotels are great but you don't always get such a personal service. As for the food, our chef Paul was amazing. Every single meal was incredible, I've never had so many delicious meals in one ski trip. I love your pre-cooked lasagne really. Every morning we had the choice of the continental breakfast or we could opt-in for a meal prepared by Paul. And when a breakfast fit for a Canadian is offered, brioche French toast with maple syrup and bacon, there's no way you can turn that down. After a long ski day, you get back into the chalet and are greeted with tea, snacks and cake. And of course, the 3-course dinners never let you down either. Now PlanetSKI doesn't tend to write a whole load about food - it's PlanetSKI not PlanetFOOD after all. But the difference between what is the standard fare in a chalet seemed miles away from that standard ribs, chicken wings and burgers offered in many Canadian hotels and bars. I would like to point out that the restaurants in my ski hometown of Banff are an exception to that, as anyone who has been there will know. The food is fabulous and the variety of restaurants second-to-none. So, what about the food with PowderNShine? Delicious starters such as foie gras, or pork belly, and main courses of pork tenderloin with truffle mash one night and lamb another. But as dessert is my favourite course, these never let me down. Ranging from mini chocolate mousses, pineapple with coconut mousse, crumble and passionfruit. Now, as I have said, the idea of having breakfast, tea and dinner with a bunch of strangers was an odd idea. What happens if we don't get on? Would it all just be hours and hours of polite conversation? What about some 'me' time? As much as I loved the food, the best part about staying in the chalet was actually the people you get to stay with and share your week of skiing. Being able to start out as strangers and get to know one another over many meals, talking about your ski day is a wonderful experience. Nothing like what you would experience when staying in a hotel at a town in the Canadian Rockies. Staying in a chalet is something utterly different than evenings in a mountain town in Canada. Everything is taken care of for you, and you do not even have to leave the chalet in the evenings if you don't want to. This is something that is great if you are looking for a week of skiing, relaxing, and being spoiled, it's ideal. However, there was also an aspect that I felt I was missing. There was never the need to go out to explore Les Menuires/Reberty, and I felt I was missing the true French experience in my UK chalet bubble. There's always a bit of a thrill getting to explore the town and see a new culture - and this was something that I felt was missing while staying in an English chalet while in France. Yes I know I could have got off the sofa, but it just seemed too much effort. Going out in the evening and being able to interact with the locals is something that I always love while on a ski trip. Now with the rentals article in my first blog I gave the comparison between Canada and the Alps a score. It was 1-0 - European rentals were a dream. The two are so different that I can't say one is better than the other. Basically I loved the pampering and the food at the chalet, but I felt in a bit of a bubble and missed going out experiencing the resort more - eating in different restaurants and après ski in different bars. Making a bit of an effort rather than having everything delivered on a platter. It's going to have to be a 1-1 draw. So far it's Europe 2 - 1 Canada. I am going to compare the ski areas, the snow and the activities on offer. Les3Vallees will have a hard fight with this one as I love the Canadian Rockies and all it has to offer.